I completely missed J.J. Redick and Adam Morrison watching their college careers fade away through their tears. Yesterday afternoon, I went to a high school baseball game, missed the early NCAA games, then came home and was so tired I went to bed and drifted in and out of sleep, and thus missed the late games. The Bruce-Mahoney Trophy is the size of a small refrigerator. Each year, my old high school, St. Ignatius (SI), decked out in red, white, and blue, competes against Sacred Heart (SH), clad in green, gold, and white, in football, basketball, and baseball. Two out of three wins the trophy and gets to keep it in their school for the year. In the all time standings, SI leads 41-18. This year, after the SH Fighting Irish won the football game and the SI Wildcats won the basketball game, it came down to baseball. The last time SH had won the Bruce was 1998, my freshman year, when it came down to baseball. You have to remember that in the spring of 1998, professional baseball was still struggling thanks to the 1994 strike, even in a town with a rich baseball tradition like San Francisco. Rain had delayed the game into April, so the SI-SH tilt was in direct competition with the defending NL West champion Giants, who drew only 10,000 people to their game with Pittsburgh. 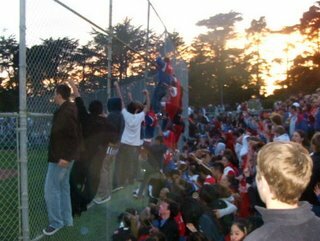 The newspaper account says 1,600 people were there, but I want to say 4,000 fans gathered at the main field at Big Rec in Golden Gate Park and witnessed a classic. We thought we had it wrapped up. That's what you think when your team is up 6-1 with two outs in the top half of the last inning. But then a half hour of misery descended, and SH was up 7-6, and then their left fielder made two diving catches in the bottom half of the inning, and then there was a mass of green and gold, hundreds of students, celebrating on the field, singing their fight song. That was the last time SH won the Bruce. This year, my dad arranged to leave work early, and we hustled over to Big Rec. We arrived during the top of the first, with SH already threatening to score. We settled into the bleachers behind the SI bench and started talking about pitching and patience at the plate. Hundreds of students, from both schools, sat closer to home plate, on either side of the backstop. In the early going, it was an uneventful game. The boys were jittery, and, well, boys, making mental errors and generally acting as if they didn't want to fail. The head SH coach is an alumnus of SI. His last season coaching SI baseball was the year he coached my Junior Varsity team. When the Varsity coach stepped down, we all thought he was in line for the job, but it didn't happen. So, he jumped. It's a hell of a bridge to cross. I only bring this up because he kept as low a profile as a head baseball coach can during the game, sitting at the end of his bench, legs crossed, arms folded. That's not how I remember him. The SH pitching coach, however, an older man, was animated and flamboyant. Each time he went out to remove his pitcher from the game, he appeared not to speak to him. He would demand the ball and then walk away, towards the shortstop, showing up the pitcher. No, "Next time," no, "It's not your day," no, "This stuff happens," no, "Good job, we'll let Danny take it from here," no, "We'll pick you up." Nothing. And he wonders why his team lost its poise and played in fear. Things got interesting after the fourth inning. SH led 4-3, and as the sun dropped lower and the chill slipped under our collars, we realized the game might not make the full seven innings. Between innings, the SH students started chanting, "Beat SI! Beat SI!" This volley was not taken lightly, and it woke up our student section. When the Wildcats pushed across the tying run, the boys and girls with their faces painted red and blue jumped to their feet, hugging and cheering and began chanting, "Beat SH! Beat SH!" and the adults in attendance couldn't help but join in. It was like that for the final three frames: stand, chant, scream, groan, stand, scream. SI added another run, and another, nibbling away with bunts and timely singles, until they were up 7-4, going into the top half of the seventh, and final, inning. We all stood for this one. Those of us who knew about 1998 looked at each other and smiled wryly. This could end badly. But, after all, it's just a high school baseball game, right? SH loaded the bases, but couldn't score. The SI pitcher kept his composure, and, with two outs and two strikes, let loose a knee-buckling breaking ball for the third strike and the Bruce. Players mobbed their hero on the mound, and student spectators climbed the fences in a vertical victory dance.